Project Pink and a handheld Surface PC anyone? Microsoft Surface PC - how the hell are they going to get that in your pocket?! The internet is awash with yet further rumour and speculation that Microsoft is preparing a smartphone (codenamed 'Project Pink') and a Tablet PC to go up against the Apple iPhone and the (rumoured) Apple 'iTablet' in 2010. Project Pink is supposedly a Microsoft-branded phone built on top of the Windows Mobile 7 core, with the device not expected to see any kind of commercial release until late 2010. However, 9to5Mac.com seems adamant that we will see a press launch for Microsoft's Project Pink at CES in January 2010 – so we will be sure to keep an eye on developments in that space in the coming months. The return of J Allard? 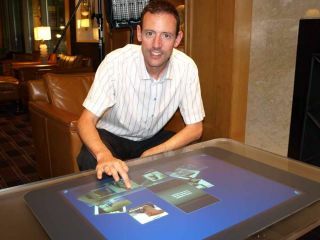 As for rumours of a Microsoft Tablet PC, none other than 'Chief Experience Officer' J Allard is said to be heading the project, notable of late for the lowness of his profile! ZDNet's Mary-Jo Foleyrecently "heard that at least one exec from Microsoft's Surface team is part of the Tablet effort, too." Foley notes that "Microsoft officials have hinted before that they're set on building a smaller Surface. At one point, that project was going by the codename "Oahu." But the new Tablet effort is allegedly part of something that is known as "Alchemy Ventures," according to the couple of tips I've gotten on it to date." Foley goes on to cite a new job description at Microsoft's Entertainment and Devices Division as further proof that a Tablet-type device is in the offing next year. The job ad, for a Senior Program Manager asks if candidates are: "Excited by Xbox 360? Fascinated by the technology that powers the Surface? Ever wonder how your Zune HD got built? Bring your talent and passion for building great products to the Manufacturing Test Engineering team! Our team is where all these cool products and more come together." Interesting stuff, for sure, but right now filed in our bulging 'pre-CES rumour and speculation' file.